Our curiosity has us doing utterly unproductive things like reading news about people we will never meet, learning topics we will never have use for, or exploring places we will never come back to. BBC – Future | Why are we so curious? Research suggests social hierarchies could be a law of nature and bring big benefits to communities. Indeed, if there’s one characteristic shared by almost every human society, it is inequality: the existence of a social hierarchy. “We hold these truths to be self-evident, that all men are created equal”, declared the signatories of the American Declaration of Independence, but the slave-owning Thomas Jefferson did not seem to think they need stay that way. Indeed, if there’s one characteristic shared by almost every human society, it is inequality: the existence of a social hierarchy. Humans aren’t alone in that. But in an ant society, at least you know where you stand: you’re either a queen, a worker, or a male, fit for nothing but reproducing. Humans, in contrast, have complex, many-tiered and overlapping hierarchical structures: only we seem to have developed the exquisitely nuanced caste of the local government officer. And though some might dream of utopias in which no one has any more power or importance than another, these social hierarchies always rear their head eventually. The use of “I” is a big indicator of the speaker’s psychological state. Chronic sadness brings with it an inward focus that translates to high “I,” “me,” and “my” usage. 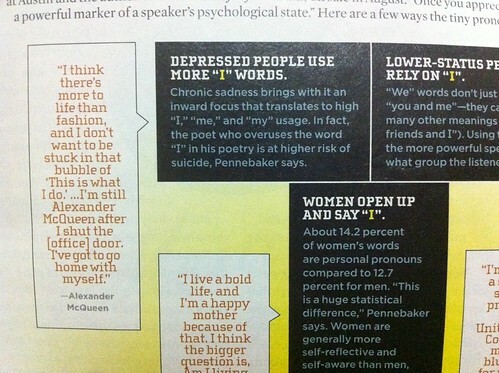 In fact, the poet who overuses the word “I” in his poetry is at higher risk of suicide, Pennebaker says. This reminds me of this poem I’ve posted previously. A poem written by one of the four NYU undergraduate students who jumped to their death in campus in 2004. Went to do some research and found the Dec 2011 article by Pennebaker from Harvard Business Review. The “I think” may seem insignificant, but it’s quite meaningful. It shows you’re more focused on yourself. I find this interesting because I like to analyse how people use words during online chat and FB status updates. Some of my friends find me strange to say that this-and-this must be feeling down just by the way they reply a message or the way they type a singular “ok”. Maybe I’m being too sensitive, but if this over-over-sensitivity urges me to send a quick “hello-how-are-you” to someone who I think might be having some problem, then I don’t mind being called a drama queen then.